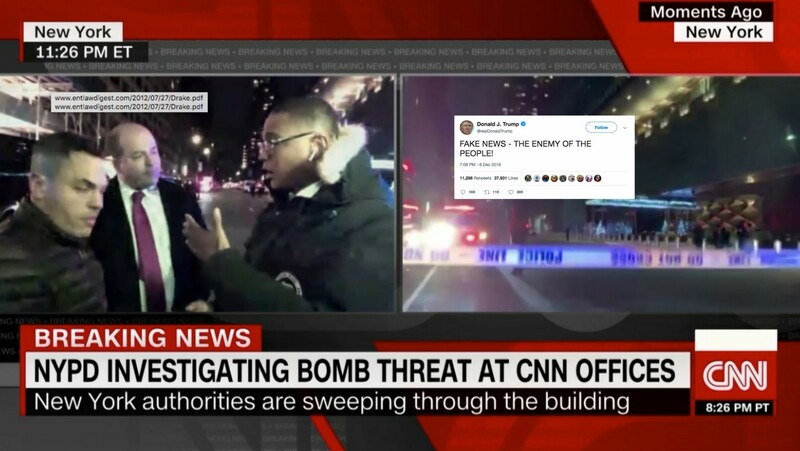 At around midnight Eastern Standard Time, CNN Headquarters in New York City late Thursday night caused the network to stop live on-the-air programming as a response to what's believed to be a hoax bomb threat, resonating fears with an evacuation. The NYPD issued the evacuation, prompting a shutdown of traffic in and around Columbus Circle near the CNN Headquarters. CNN was left to air taped programming due to the evacuation and mandatory law enforcement scan of the area, with a potential sweep using bomb-locating dogs. CNN responded with immediate evacuations for all staffers located inside the CNN New York facility at the Time Warner Center building. All of this was occurring amidst broadcast of Don Lemon's "CNN Tonight," which was brought off the air after a prolonged commercial interruption. "We appreciate the swift action by the local authorities, and the patience and professionalism of all the employees who were impacted,” Zucker added. As of now, the threat is believed to have been a hoax, but after the mail bombing incident prior to midterms there are being left no room for skepticism. "We were told to evacuate the building and to do it as soon as possible. We grabbed what we could and got out of the building and now, we are standing outside of the building," CNN's Don Lemon said. For now, the all-clear seems to assume the facility is safe and sound. This is a developing story and we'll update you as soon as possible. This is how the Criminal News Network gets ratings when they are worse than the national enquirer in reporting real news. Just look, now they are somehow trying to imply that its President Trumps fault GB croaked, all while keeping quiet during the funeral event. Trumps body language was appropriate but Obamas nose was in the air.